Why are animals cute? Scientists on Twitter compete in #CuteOff of adorable species. What Makes an Animal “Cute,” Anyway? 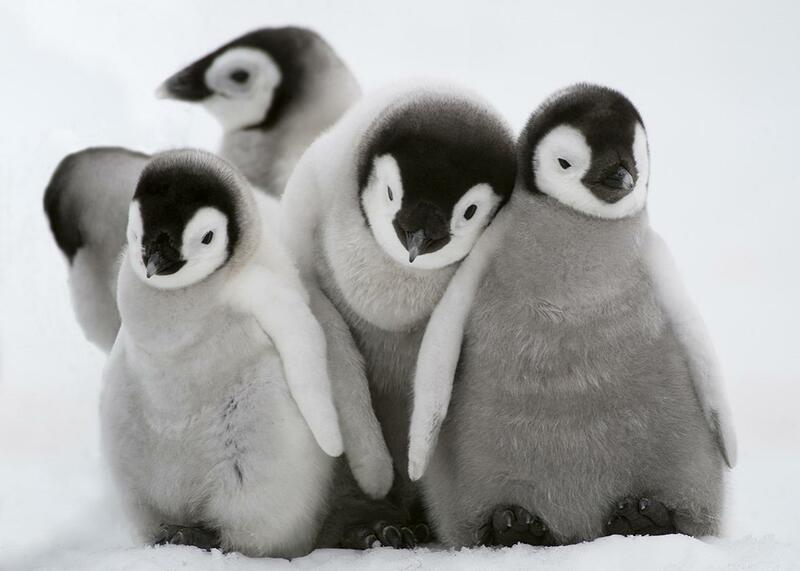 Emperor Penguin chicks in Antarctica, August 18, 2010. Scientists on social media are redefining “cute.” Prompted by two researchers at Virginia Tech, Anne Hillborn and Marcella Kelly, scientists have been posting photos of their most adorable research organisms to Twitter with the hashtag #CuteOff. Whether or not these critters qualify may be in the eye—or the research study—of the beholder. Though sleeping monkeys will give that cub a run for its money. Then again, who doesn’t love a teeny tiny frog? But you might find it a bit harder to find these specimens particularly adorable. You may have mixed feelings about sea pigs, but come on, it’s called a sea pig. Someone described this tenrec as a “cute little monster.” Maybe cute, but certainly not cuddly. The Field Museum wants you to appreciate the squeee-worthiness of this bat. No? Come on, just a little squeee. Look at it! So what’s going on here? Do researchers really think their own study organisms are the cutest in the land, or are they biased? What makes a creature cute? Researchers who study humans’ preferences for physical attributes of other species or inanimate objects have found that infant-like features, such as large, wide-set eyes and an enlarged head, as well as human-like traits, are considered most appealing. Since the middle of the 20th century, researchers (and pet product marketers, certainly) have been investigating this phenomenon and its implications. Recent research by Julie Hecht and Alexandra Horowitz showed that most of the undergraduate students participating in their study who were shown digitally-manipulated photos of adult mixed-breed dogs preferred the photos of dogs with bigger eyes, more space between their eyes, and smaller jowls. Hecht and Horowitz’s findings support those of other researchers who showed that dogs exhibiting paedomorphic, or juvenile, facial expressions are preferentially selected by humans, giving them a competitive advantage in their modern environment. This suggests that the domestication of wolf populations involved not only selection for tameness, but perhaps trended toward irresistible “puppy-dog eyes,” as well. Humanlike personality cues are also important when it comes to our animal friends’ faces. In Hecht and Horowitz’s study, participants were likely to prefer photos of dogs with colored irises and a distinct “smile,” characteristically human-like traits. The appearance of wide-set eyes and a smile certainly make this nudibranch a contender for the #CuteOff. In humans, symmetry and averageness are typically perceived as attractive traits. A more average face is one that is more similar to a computer-averaged composite of multiple faces. In 2003, Jamin Halberstadt and Gillian Rhodes tested whether this principle applies to humans’ perceptions of birds, fish, and an inanimate object—an automobile. Using computer-generated line drawings, the researchers found that a sense of familiarity was associated with study participants’ preference for the more average drawings of all three items. Halberstadt and Rhodes also discovered a general preference for “averageness,” independent of a sense of familiarity, for birds and fish; multiple research studies have suggested this is tied to our perception that a more average face is an indication of genetic or physical quality. Perhaps this is related to the fact that we think our dog, cat, rabbit, hamster, fish, snake, or child, is the cutest of all the dogs, cats, rabbits, hamsters, fishes, snakes, or children, for reasons certainly related to our personal bond or connection with them. In the same vein, maybe each researcher is going to think her study critter is the cutest of all the study critters, even if it is prickly, slimy, blood-sucking, creepy-crawly, or just plain devilish. When you open a trap and find one of these inside. But, really, I do have the cutest dog of all the dogs. Physical preference can affect decision-making, and when it comes to scientific research, conservation, and pet adoption, it turns out cute does matter. As Hecht and Horowitz point out, the endangered species that tend to get the most attention are those more closely related to humans or with “decidedly human-like” characteristics. Additionally, studies have reported that appearance and personality are two of the key factors affecting people’s choice of pet when adopting from a shelter. Shelter staff and volunteers should help potential adopters find the pet that is the best fit for their family and home to discourage picking an animal based on appearance alone. Sometimes, cute can be overrated.